I really love my hair especially when it's in its curly form. I use my own product line which is the Sheabeutimia Natural Skin and Hair Care line. In terms of Shampoo, I use the Conditioning Shampoo. Conditioner: Hemp Moisturising Conditioner. Deep Conditioner: Sheabeutimia Protein Repair Mask which will be out soon. Moisturizer: Any of the Sheabeutimia Hair Creams. DIY: I was using yogurt to deep treat my hair in the beginning but recently I realised the protein in the yogurt is too strong for my hair thus made my hair break after using it. So now my DIYs are mostly hair rinses. Sealant: I love the Sheabeutimia Growth Serum. Styler: Sheabeutimia Crambe Growth Cream, this cream makes my hair very manageable and enhances my curls such that I cannot do without it. 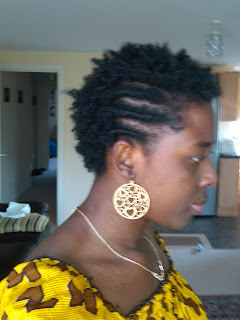 My hair regimen is quite simple. If I am not doing a mini twist challenge which lasts for a month then I make sure to do a weekly wash. My Regimen: I deep condition every week, apply my leave-in which I have mixed with my serum everyday to moisturize my hair. Sometimes I do the baggy method or just put on a shower cap when at home after moisturizing. Puffs, Two Strand Twists, Fringe. The hardest part of my journey was when my hair was so short that I couldn't do anything with it. Being natural has taught me to be confident and to develop my skill of mixing ingredients.